Want to say “I do” on the world's most beautiful island? 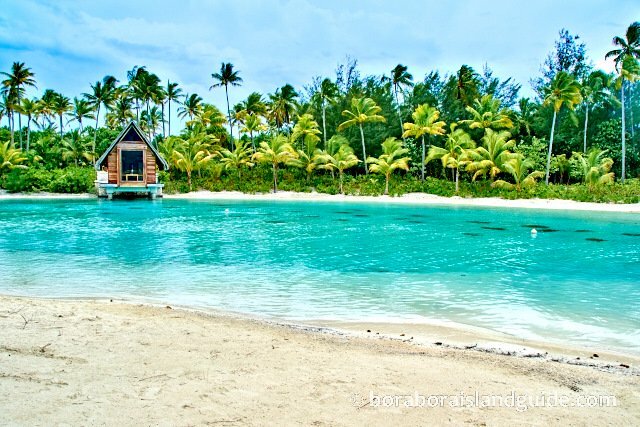 Bora Bora weddings offer magical choices that will be remembered ever-­after. You can quietly elope and marry in front of just an officiant, or invite family and friends to help you celebrate. Bora Bora weddings are usually smaller affairs. 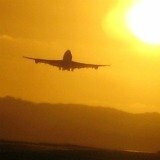 Having an overseas wedding will naturally exclude some guests. You're likely to have a more intimate wedding than back home. 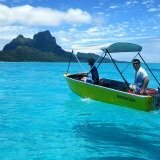 But if you're planning to have a larger wedding in Bora Bora, there are exotic locations for those too. Polynesian Traditional Ceremony or Western style? 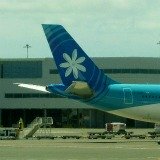 Nelly Grange, a marriage celebrant, has arranged many Tahiti weddings. She advises clients that a destination wedding is all about location. 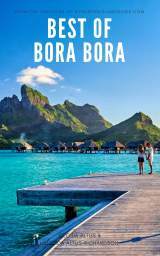 There's a dizzying choice for Bora Bora weddings. 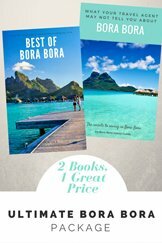 The exotic panorama of majestic Bora Bora Island, turquoise lagoon, and palm fringed white-­sand beaches, makes a stunning vista for weddings (and background for photographs). You can have your wedding on a pristine beach. 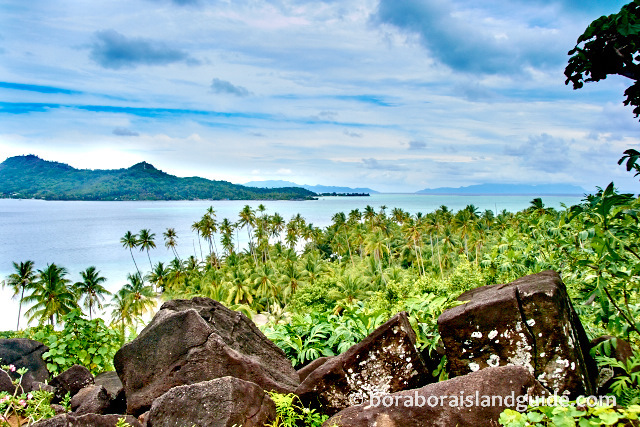 Or in a chapel, facing some of the best views in Bora Bora. The Hilton's chapel on top of the hill. View from the hilltop chapel. 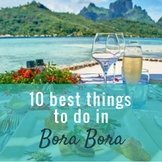 Best wedding locations in Bora Bora? 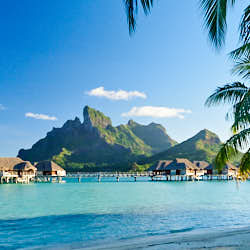 Couples now find it attractive to 'elope to Bora Bora' to get married, and then continue on with the honeymoon. 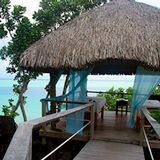 So the luxury resorts are experts at providing exceptional Bora Bora weddings and each offers several wedding packages, with varying price tags. Each resort has it's own wedding planner to take care of all the details. 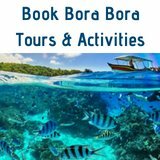 Bora Bora resorts also provide all extra services such as hairdresser, make­up artist, or photographer. Some have a black pearl store so you can marry wearing exquisite Tahiti pearls. St Regis boasts a full bridal boutique. 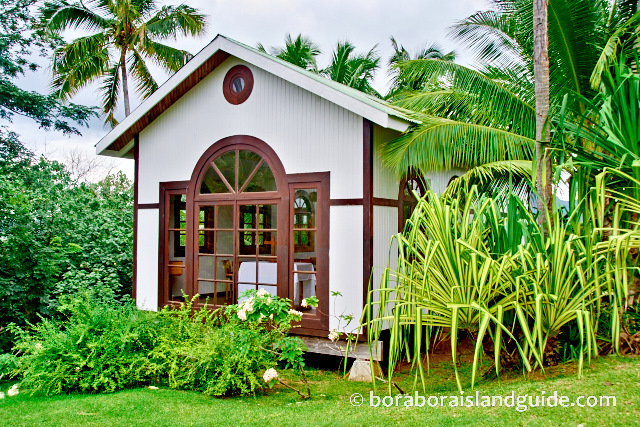 All the luxury Bora Bora resorts have petite wedding chapels where couples can tie the knot, or renew their vows. Each resort has a beautiful beach area set aside for wedding ceremonies. You can also hold a reception in a special area of the resort grounds. For example, St Regis, which takes great pride in offering the most extensive wedding services in Bora Bora, can cater for up to 100 guests in it's outdoor area, overlooking the lagoon and Bora Bora Island. For those desiring a more intimate, natural setting, resorts also arrange weddings on private motus. This can be a traditional Polynesian style ceremony, with music and dancing, where couples adopt a Polynesian name. Or with the elegant simplicity of saying “I do” in front of a marriage celebrant. You can follow the ceremony with a Polynesian banquet on the beach. At the Sofitel Private Island Resort you can marry on a unique hilltop deck, above lush gardens, with panoramic views of Bora Bora Island and the lagoon. Wondering where to book your Tahiti wedding or over water bungalow? 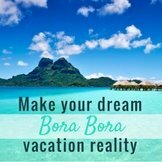 Check out what each of the luxury Bora Bora resorts offers, before you decide. 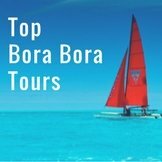 If couples arrange services themselves, Bora Bora weddings can be individually personalized, and have a smaller price tag. This enables you to have something different, and hire the providers of your choice. 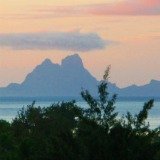 To create your own signature wedding in Bora Bora, on a private motu, you will need to connect with a licensed Tahiti wedding planner and marriage celebrant. If you're bringing a party of guests to celebrate, consider hiring a yacht, at a similar cost to what it would be for you all to stay at a luxury resort. 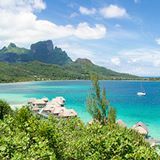 Sail around beautiful islands in Tahiti and have a wedding planner organize a personalized, private motu wedding alongside the Bora Bora lagoon. 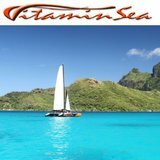 Paul Gauguin sails Tahitian waters offering an amazing all-­inclusive wedding and Tahiti honeymoon. 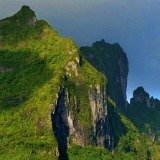 It's a wonderful way to visit a number of gorgeous French Polynesian islands, without having to pack or get to airports. 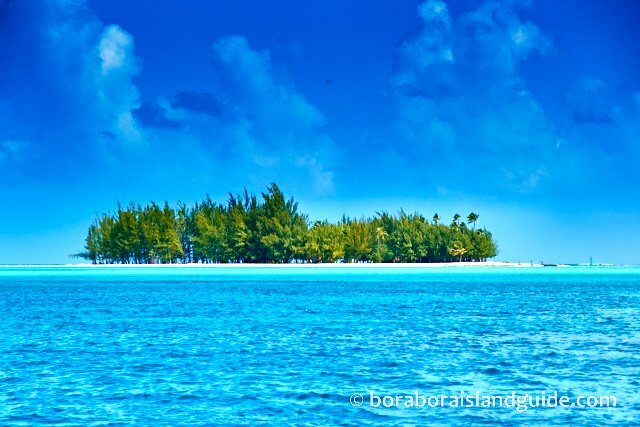 These 5 star cruises offer an opportunity to get married on a beach in Bora Bora. The ceremony is organized by the cruise director. With the captain officiating! 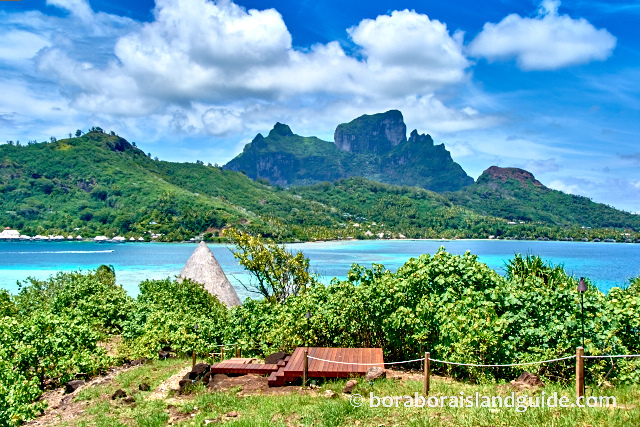 Couples who are not of French origin, or residential status, can now legally marry in Bora Bora. On the wedding day, you attend a simple ceremony at the town hall, with a representative of the mayor presiding. You must each have a witness, which the mayor's office can provide if necessary. Your resort, or private wedding planner, will arrange for you to get there by boat. To have a legal Tahiti wedding plan ahead! It is recommended that you choose a wedding date 4 to 5 months after you begin your application. Paperwork must arrive at the local town hall 45 days prior to Bora Bora weddings. This process will be handled by the resort where you book your wedding, or the private marriage celebrant you engage. Bora Bora weddings are a once in a lifetime event. 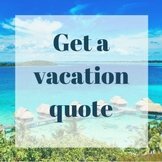 Use a specialist travel agent who is experienced at creating Tahiti destination wedding and honeymoon packages that delight. 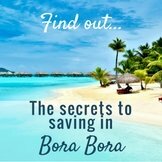 Ensure a seamless Bora Bora vacation for the best price.